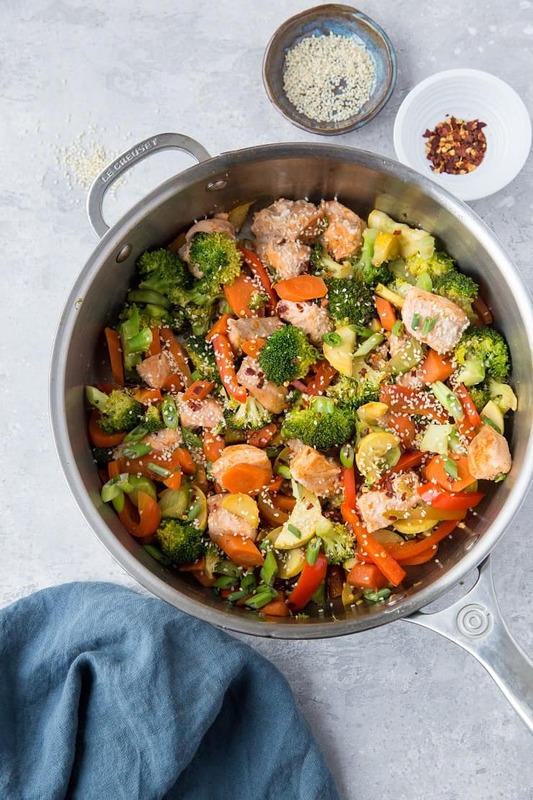 Fresh and frisky salmon stir fry for a clean, paleo, keto, and whole30 dinner that is sure to become a staple in your home. I make a lot of stir fry. Like a lot. In fact, when I’m not developing new recipes for this site or for clients,, all of my meals are sauteed per the stir fry method. Why do I love stir fry so much? It’s speedy quick to prepare, and the way I go about it is super clean using meat and veggies and homemade sauces that are free of soy, sugar, wheat, etc. In essence, baby gets fed fast, and fed well. As you may have surmised, salmon is one potentially my favorite animal protein. Historically, when a salmon craving would hit, I would roast up a fillet and stir fry veggies separately. WELL, it dawned on me I could turn the whole thing into a one-pan experience and simply stir fry the salmon into my veggies. BOOM less cleanup, well-rounded, delicious. Between the prep and cook time, this stir fry takes roughly 30 minutes to make. It’s a marvelous meal prep recipe for lunches or dinners, and can easily be made in bulk to feed a crowd. 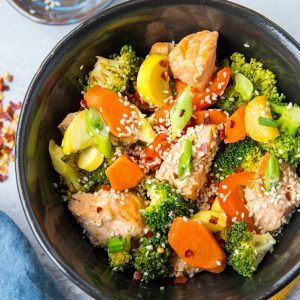 If you liked the idea behind the Chicken Fajita Meal Prep Bowls I posted earlier this week, you can execute the same concept using this stir fry. 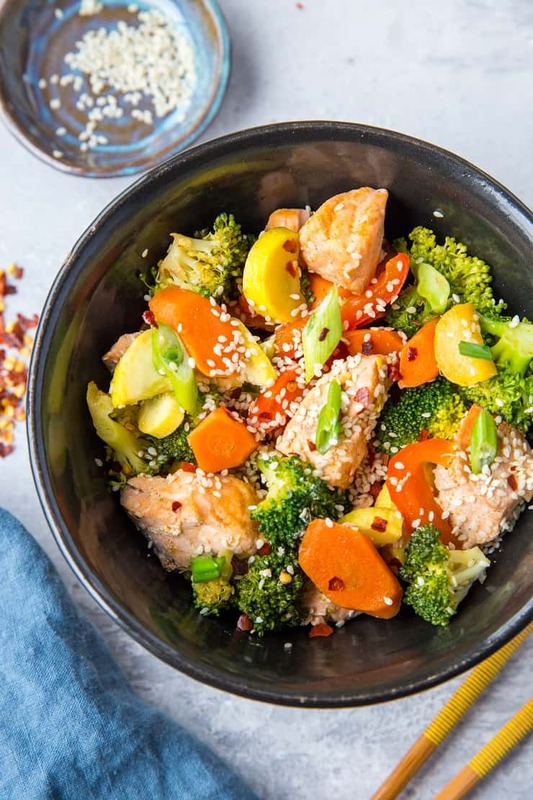 If you love a good teriyaki, you can replace the coconut aminos with your favorite homemade or store-bought teriyaki sauce. 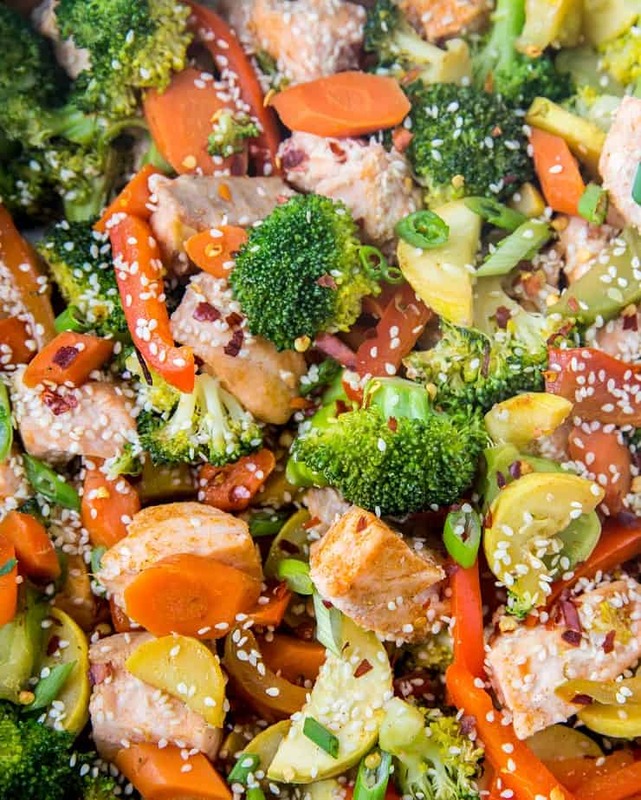 Coconut Secret makes a fabulous Teriyaki Sauce that is clean and paleo-friendly. Swap out the broccoli, carrots, and bell pepper for other vegetables, such as bok choy, cauliflower, parsnip, turnip, etc. 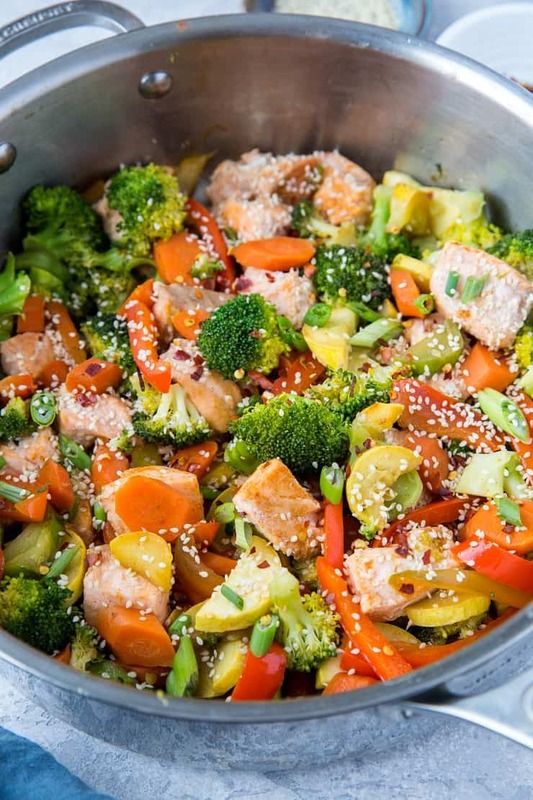 Serve stir fry with choice of cauliflower rice, regular rice, rice noodles, etc. if desired. I like to eat the stir fry as is with no additional side dishes. 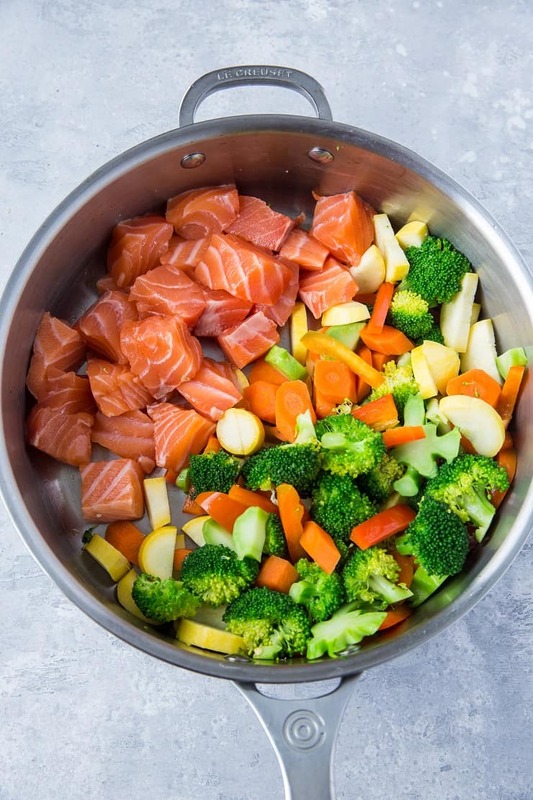 Once you add the salmon, use a spatula for the rest of the cooking process to gently get under the salmon and veggies without breaking the salmon. 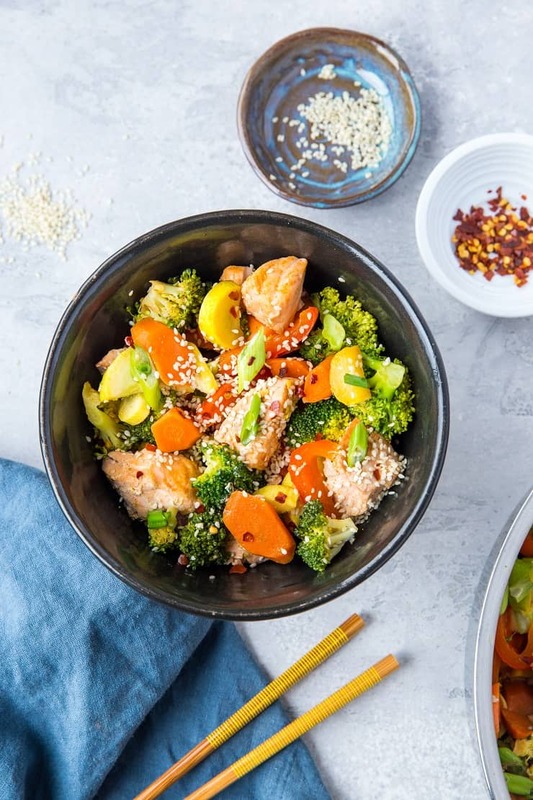 Salmon is much more delicate than other animal proteins, so if you’re looking to keep the whole chunks, carefully employ the spatula rather than a wooden spoon or any other cooking tool. Place salmon fillet on a cutting board and use a sharp knife to remove the skin. Chop salmon into 1-inch chunks. Set aside until ready to use. Heat the avocado oil in a large skillet or wok over medium heat. Add the carrots and cover. Cook for 2 minutes. Add broccoli, bell pepper, and garlic. Stir, and cook covered for 2 minutes. Add yellow squash and stir in to the vegetables. Scoot vegetables off to one side of the skillet. Add salmon, coconut aminos and sea salt. Cover, cook 3 minutes. Uncover, cook 5 to 6 minutes or until much of the liquid has burned off and salmon is cooked through. Stir everything together (I recommend using a spatula to help keep the salmon chunks whole). Season to taste with sea salt. *Make this recipe Low-FODMAP by omitting the garlic. This recipe looks so delicious it should come with a warning “one may over consume this recipe..” Honestly, I would be the “one” who needs this warning too. 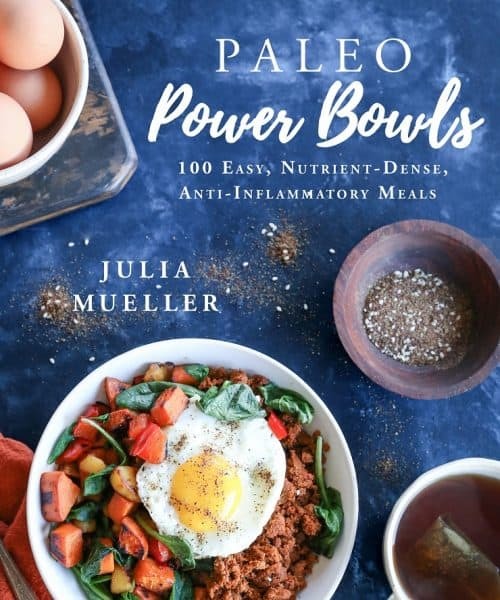 Julia, this recipe is so healthy and delicious. Thank you. I definitely over-consumed it, so you’re absolutely correct that it should come with a warning, lol!! It’s definitely a great household staple. 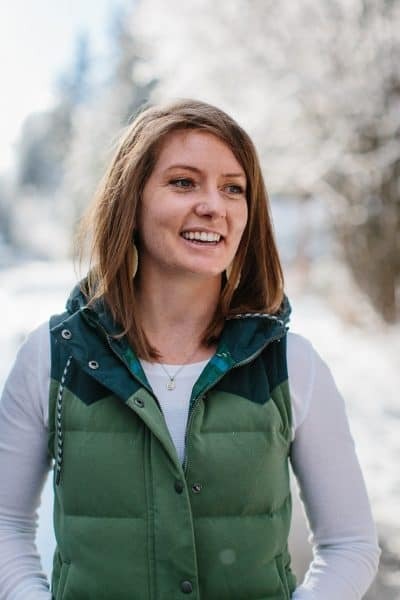 I asked you before for the name of the book you wrote about fodmap and recipes. What is the name of it? I’d like to buy it. This recipe went right into the “KEEPER” file. Nice job. Loved it. Added cilantro and black and white sesames to the top after cooking. Perfect!! Thanks.